For most of his adult life Alduce has kept to the shadows… until now. 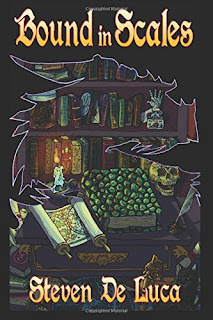 His passion to complete ‘The Atlas of Dragons’—the definitive guide to dragon lore—consumes him and he must emerge from the safety of his studies to face the world once more. After years of research he has discovered the secret to unlocking the fabled gateways, powered by a legendary lost metal known only as Flaire. Risking his life on an experiment fraught with danger, he embarks on an unimaginable journey to another world, where dragons are real. He will forge an unlikely new friendship and face the ultimate test to his humanity, changing his life forever. His voyage of self-discovery leads to lies, deception and betrayal that threaten to destroy everything he has strived to achieve. Will Alduce find the answers he seeks? Can he learn from his mistakes and find redemption? Or will he choose the path of destruction? Fantasy is not my preferred genre so I didn't really know what to expect when embarking on Bound in Scales by Steven de Luca. A couple of hours later, I was like a newly hatched dragon emerging from an egg, blinking in an attempt to focus on the time when I managed to tear my eyes away from the page. There's magic in this book, that's for sure; it even made me forget about my morning cup of tea to the point that the tea was STONE COLD. Books have come close but have never succeeded in making me forget about my first cuppa of the day until Bound in Scales landed on my kindle. Alduce is a bit of a loner, content with his own company he is writing an Atlas of Dragons and what better way to study these fine creatures than from within their midst. Using science and sorcery, Alduce adds shapeshifter to his repertoire as he transforms into magnificent black dragon, Nightstar. In the land of dragons, he befriends a yellow dragon named Sunburst and together the pair form a friendship that will be tested time and again. With Alduce being a human, his thoughts and fears, hopes and dreams are completely relatable. When he becomes Nightstar, he is still the same person underneath and his whole character is part of who Nightstar becomes. With individual personal strengths and surprising insecurities, the dragons became characters I quickly began to care about, forgetting at times that they were beasts not people. 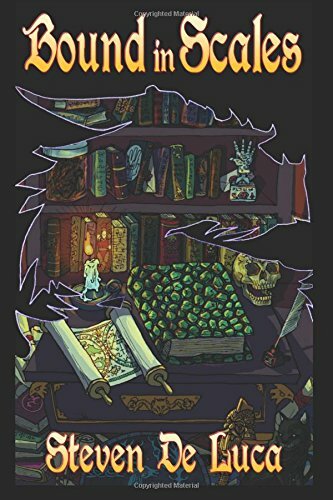 The whole story had me gripped from start to finish, from Alduce trying to keep his identity a secret from the other dragons to the battle with the evil Extractor who sees dragon blood as a valuable commodity. The writing is excellent as landscape and characters are described so vividly that I could easily visualise the intended scenes. I have to applaud the author for his amazing Northern Lights scene as the breathtaking beauty of this natural phenomenon is described with such reverence and clarity through Steven de Luca's outstanding imagery. Harry Potter meets Game of Thrones in this fantastic debut from new fantasy writer, Steven de Luca. Remember that name as I'm sure we're going to be hearing a lot more about him. Don't be put off if fantasy is not your preferred genre, this is an extraordinary piece of pure escapism fiction and one that I will enjoy reading again...hopefully along with a sequel so we can continue the adventures of Alduce and Nightstar. Try something new and take a chance on Bound in Scales, you won't regret it!